If you are keen to get going on wagering online then the Roxy Palace Casino is a fabulous place to do it with bags of style and some free cash. Ok, so let’s start with the idea of some free cash, shall we? This is something that you can take advantage of very simply as soon as you sign up. In fact, after you first get registered you have 72 hours in which to make your first deposit and claim a handsome bonus into the bargain. You then get a 100% cash match on your initial deposit, up to £150. The good times don’t just end there, though. Your second deposit also gets a bonus, which is a 25% bonus of up to £200 in this case. Once you get to this stage you will also start getting the daily promotions from Roxy Palace Casino too. 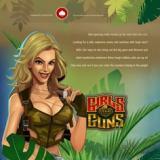 The site itself has the brilliant range of games that you would expect. From blackjack to roulette and from online slots to live casino games, it is all here for you enjoy whenever you fancy a game or two. Give this site a look over and you will find a place where you feel welcome and can have a marvellous time playing the games that you most love.